Understanding how the various aspects of chronic illness affect both patients and their families is essential for nursing students. 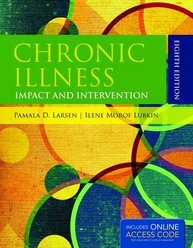 The recently published Lubkin's Chronic Illness: Impact and Intervention, Ninth Edition Includes Navigate 2 Advantage Access by Pamala D. Larsen is the only text of its kind to address not only the physical aspects, but also the psychosocial issues that affect individuals and families living with chronic disease. What's more, the author lends a personal perspective by chronicling throughout the text her own experiences with her husband's terminal illness.